It appears Chevy is doing a version of Doritos Crash The Superbowl contest where video contestants can enter their 30 second spots for a chance to win an opportunity to be part of the marketing industry's favorite game - Ad Bowl. Unfortunately for the Chevy contestants the top prize is $10,000, not the potential for $1 million like the orange chip maker is doing; though, the million dollars is awarded only if the commercial "is awarded one of the top 3 spots (including ties) according to the USA TODAY Ad Meter rankings. The Doritos campaign to win a commercial during the Super Bowl has been going on since 2007. This is Chevy's first year. Doritos launched their original campaign on YouTube while Chevy has decided to go with MSN's website for the hosting of their Chevrolet Route 66 contest. Chevrolet coordinated film submissions with MoFilm, a crowdsource video site that caters to film students and pro-am video producers who can enter contests from a variety of top brands across the world. 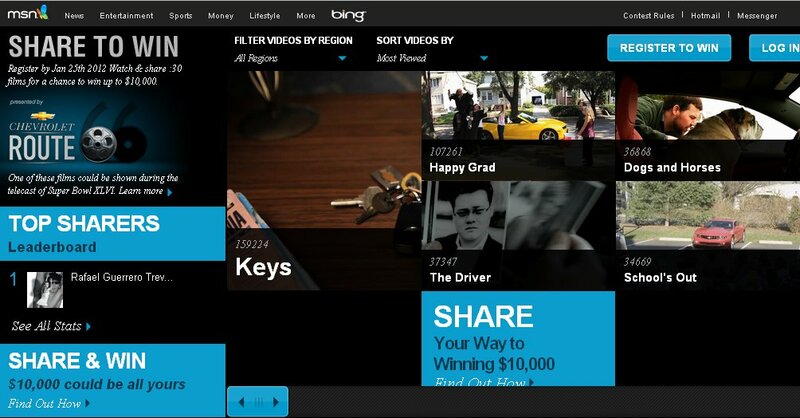 MoFilm and Chevrolet received over 200 video submissions from the MoFilm site and then curated that list to 30 top finalists that people can vote and share from the MSN website. It makes sense doing the voting from the MSN site, since MoFilm doesn't get the large general market traffic like MSN or a YouTube does. Of course, if Chevy continues this contest for multiple years perhaps it too can have the elaborate experience Doritos now has with CrashTheSuperBowl.com. Currently an ad called "Keys" featuring various keys and what they may or may not go to is leading. It feels very much like something Chevy's own ad agency could have created for the current Chevy Runs Deep campaign. Of course one wonders why Chevy is even doing a crowdsourced commercial? Isn't this idea a bit dated and it feels more copycat than original after years of UGC ad contests. Perhaps Chevy's "happy with them in general" agency Goodby Silverstein & Partners issues go deeper than just some lack of "consistency"? I'm personally voting for "Miss Van Der Volt!" It's so odd it is endearing and well a certain madman thinks it's worthy of a vote. shape and rigidity of the chips made them inherently dangerous.